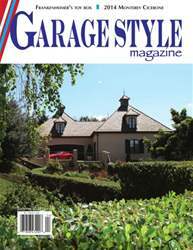 The May issue is out and about, and boasts our annual Monterey Cicerone and many fantastic collections. Our cover garage is in Northern California and features an apartment, wine storage, full entertainment center, and a lifetime of collecting red. Rodney Kemerer takes us into the private refuge of the late John Frankenheimer, where he enjoyed amassing and building model cars. If you haven't already done so, make your arrangements to attend Monterey - Pebble Beach, Bonhams, Mecum, and so much more go on during that week, people come from around the world and lodgings fill quickly. Can't find an issue? Subscribe at the tab above - save money and never miss an issue!